This past weekend (week!) 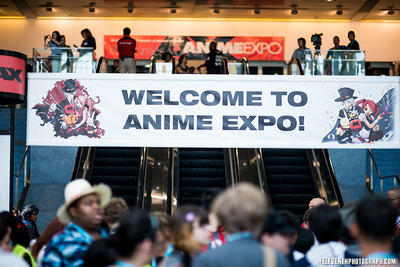 I was in Los Angeles attending the 2012 Anime Expo at the LA Convention Centre, and an awesome blast it was! Our trip began with me and Alex driving down to Buffalo from Toronto, we arrived early just in case of any issues; but to our amusement our plane was delayed by about two hours! We bunkered down and toured the complex a bit, played some games on our phones, and even started watching Airplane! on Netflix but never got to finish it, I do love free wifi at airports, its a Godsend. We had a turn-around in Cleveland to another plane but never made it in time due to our first plane being late. We had another few hours to kill in Cleveland. We did arrive in LA around 10pm, and taxi'd our way over to our hotel in Santa Monica. My most expensive Taxi ride ever. It was around 11 when we checked into our hotel, and there were no restaraunts open at that time, we checked out the pier where we chatted to Zoltar - rather he told us our fortune after we gave him a dollar each. I remained the same age the next day. Next morning we went and toured the beach, I was in the water for about 15 seconds before I called it quits because the water was freezing. Alex and I did build sandcastles however, even received a compliment from the passerby (1 of about 20 people visible on the very large beach). There was a thick mist so we had no sun, it was a rather depressing beach visit. We went back to the hotel befor heading down a block for lunch, and yes the food tastes damn good after having not eaten in over 12 hours, we were both starving at that point. We took a bus over to Downtown LA in the aftertoon to our Westin Hotel, looks great from the outside, even better on the inside! We were in the yellow section of the four cylinder buildings, and took the elevator that Arnie S. took in his movie True Lies, awesome bonus stuff. There was a bridge from the hotel on at least three of the four sides, useful if you don't want to go to ground level and cross the street I suppose. 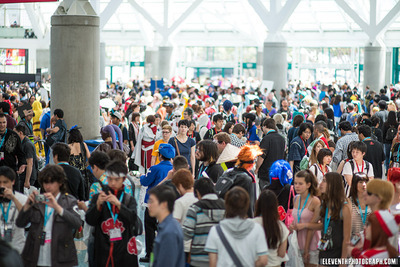 It was Thursday so we went to pick-up our prereg passes, the line was loooong. You may be asking "a mile long", I'll reply with 'I only wish it were". Ok, well maybe it wasn't like 3 miles long, but it definitely felt like it was a mile. Despite its length it moved rather quickly, we were in the line for only about 2 hours compared to 1 and a half hours for Anime North, and AN's line was probably about a fifth of the length. The staff/volunteers at the con seemed pretty competent and committed to providing a great experience, so thumbs-up for that. 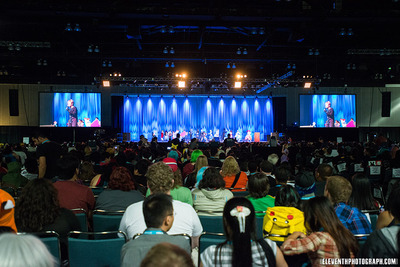 The main room of the convention is pretty big and its the main area where people gather. Every single time I circled the room there would be a new cosplay I would have not seen yet, even at 7 or 8 o'clock at night, it was rather amazing. I believe it was Friday night where we went to a restaurant called Akasha, though you may know it better as Flynn's from the Movie Tron. It was a thrill to go through the front door and it was much different then the arcade-heavy place from the 80's, it was a very elegant place to dine with a full house. Jeff Bridges was not in attendance unfortunately, I even asked the hostess to be sure. The days are a bit of a blur to me, Friday, Saturday, Sunday, 2 hours on Monday and a bit on Thursday. The longest convention I’ve been to yet. Unlike Fan Expo, AX (and pretty much every other convention I attend) gives you a lanyard with your pass on it, very much appreciated and far superior to the sheep-tagging wristbands. The other thing that threw us for a loop was that the masquerade was on Sunday night, and not the typical Saturday night, as per norm. Despite the $10 entrance fee, the masquerade I can say was one of the best I’ve seen. We there only till after the half-time show, but the majority of the skits and walk-ons were full of energy and quite entertaining. It was a HUGE stage, with two large screen projectors on either side. I’ve got to say the quality of those screens and projects was awesome. Very clear, sharp, smooth motion and big, especially when you look to the centre and realize how far away you are from the tiny-looking cosplayers on the large stage. 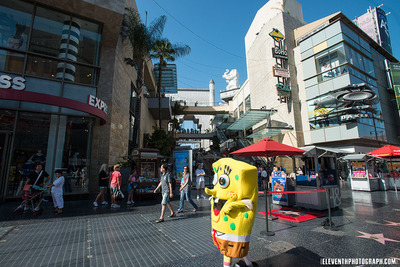 We headed down to Hollywood boulevard to check out the stars Monday afternoon, and hit our 4th and last major restaurant in LA. Alex did drag me around town to the furthest corners of the city, but it was worth it for the yummy food J. We must’ve walked by about at least 10 lingerie stores; it was almost worrisome how many of them were there. There were some pretty cool stores to check out at the boulevard, a fun place. I will note that there are many many homeless people in LA, and they make Toronto ones almost look like fashion models. Our plane departed Monday night (thankfully on time) and we had a 5 hour flight to Washington, where we barely made our next plane. LA airport is lame because there is no free wifi, ugh. We literally just walked from one gate to the next right across the hall, where we departed 10 minutes later. I only had maybe 3 hours of sleep by that time and a sore throat; it was a nightmare driving back from Buffalo to Toronto in that condition. We made it safely back and I had a healthy 30 minute nap which lasted an hour longer before heading home. Great trip over-all, and we’re certain we’ll go to next year’s for some more fun. Page 1, 2, 3, 4, and 5. 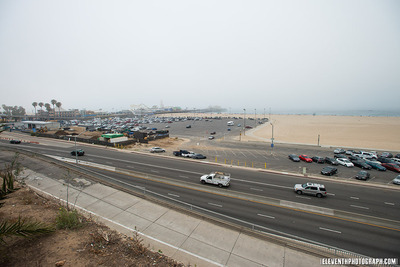 General touring photos of LA are here. Photoshoots will be up later, thanks for your patience, and for the read. Also something new, I'm willing to sell individual photos to respective cosplayers for $5 a piece and $3 for any additional if there are. Photoshoots sets will also be for sale to respective cosplayers. So if you feel that you would like a Full-resolution (4000 pixels on long side) free of watermark and additional touch-ups, please e-mail me for more info! This extends to all previous photos I have posted.